The Grand Cru Classé Château La Tour Carnet is located in the AOC Haut-Médoc, a stone's throw from Saint-Julien, next neigbor is Château Lagrange. For a long time, the estate and the wines were in bad condition, until the takeover of Bernard Magrez (owner of Chateau Pape-Clément) revived the potential in 1999. Extensive renovations of vineyards and cellars led to a wine that is today rich and intense and thus more than corresponds to its historic rank as 4th Cru Classé. There was also a lot of investment in new barriques, today the wine is aged in up to 50% new barrels, which strengthens structure, aroma and noblesse. The 48 hectares of vineyards are planted with 56% Merlot, 40% Cabernet Sauvignon, 3% Petit Verdot and 1% Cabernet Franc, each variety grows is in the optimal soil, the Merlots rather on the hills, the Cabernets rather on the slope. 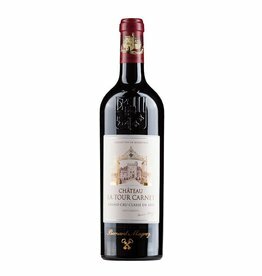 Since the year 2000 Tour Carnet is the optimal Bordeaux for fruit drinkers. It shows great charm already in its first years of live, due to its opulence and the ripe tannins. However, it is also storable and gains in aromatic complexity with further bottle ageing.